Spinach is one of those vegetables that is so healthy you think you’re going to hate it. Then you taste it, realise it’s delicious and you can’t believe you have discovered yet another healthy food that you want to eat. 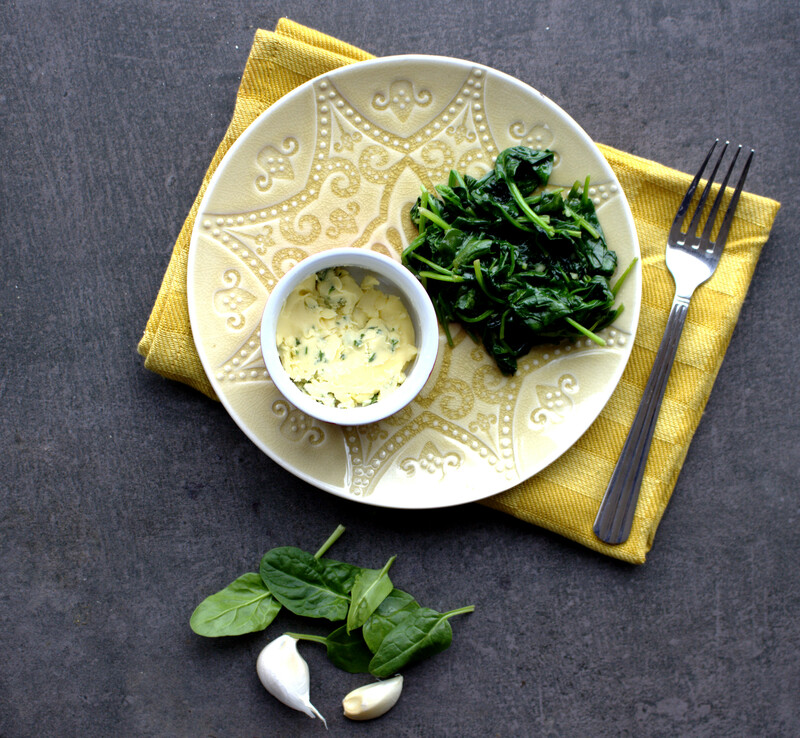 Sautéed Garlic Spinach is a firm family favourite of ours and we have it at least once a week. It’s an easy side dish to whip up and we know we’re getting a healthy dose of greens too. The trick is to have a portion of my garlic and herb butter made in advance. Then, this dish only takes literally a few minutes to prepare. We usually make a batch at the weekend. It keeps great in an airtight container in the fridge ready to dress up our meat and vegetable dishes! Sautéed Garlic Spinach goes great with steak and asparagus and we often have it on a Friday night as a treat to ourselves after a long working week! After oven a year on the Specific Carbohydrate Diet (SCD), I still tolerate cooked spinach better than raw so this recipe is perfect for a happy digestive system. I love side dishes that are ready in less than half an hour. We tend to steam our vegetables on lazy Sundays when we are at home but this Sautéed Garlic Spinach is great for a rushed work evening dinner. Here’s to healthy fast food! Bet you didn’t think there was such a thing :). Recently, due to bad weather conditions in Spain, there was a big shortage of spinach in Irish supermarkets. It was impossible to buy spinach for well over a week. I was visiting supermarkets daily like a mad woman checking to see if it was back in stock. Luckily, the shortage is over now and we can get our weekly spinach fix again. 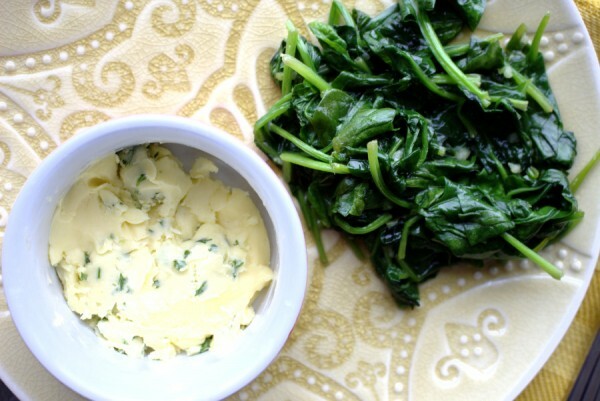 You can find the link to my garlic and parsley herb butter here. A deliciously simple yet tasty side dish free from: gluten and grains. Specific Carbohydrate Diet and Paleo-friendly. 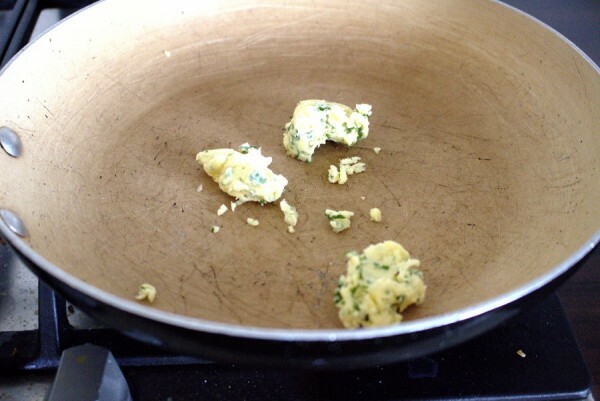 Melt the garlic butter in a frying pan on a low heat. 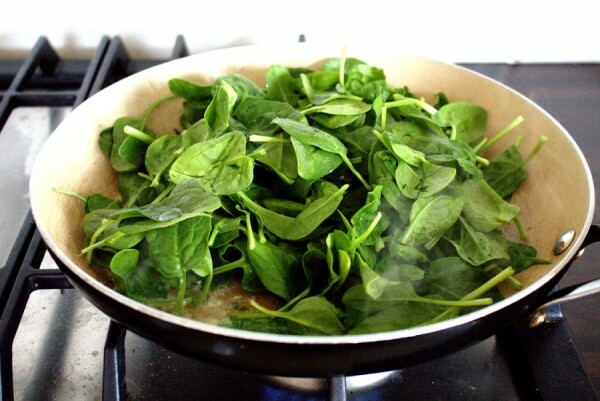 Add the spinach and continue to cook on a low heat until completely wilted. This takes roughly 10-15 minutes. 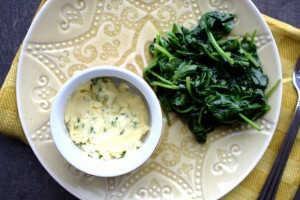 Stir often to coat the spinach in the garlic butter.